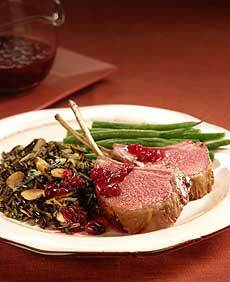 Cranberry-Marinated Rack Of Lamb is a wonderful fall and holiday dish. Photo courtesy of Meat And Livestock Australia. Lamb is delicious year-round, but this special recipe collection uses seasonal accents—cranberries, wild rice, maple and apple, for example—to give these delicious cuts some fall flair. To learn more about the different cuts of lamb, visit our Lamb Glossary. This is Part 1 of a four-page article. Click the black links below to view the other pages. This recipe uses lamb racks. Prep time is 30 minutes with a cook time of only 10 minutes. To make a speedy 30-minute meal, cook the rice and marinate the lamb the day before. Heat the rice through in a pan with a little water, stock or wine, and toss with the remaining ingredients just before serving. Serves 6. Place racks of lamb in large, deep dish. Add juice, wine, cranberries and rosemary. Cover and marinate 2 to 3 hours or overnight. Remove lamb from marinade, pat dry and season to taste. Place marinade in saucepan and bring to boil. Reduce heat and simmer until reduced to a thin glaze. Discard rosemary. Keep glaze warm. For the rice, place rice in pan of cold, salted water, and bring to a boil. Cook for 10 minutes. Turn off heat, cover and allow to steam for 20 minutes (rice will swell and curl). Return to a simmer and cook for 10 minutes or until tender. Keep warm. Just before serving, toss through the almonds, oregano, orange juice and zest. While rice is cooking, preheat oven to 400°F. Heat oil in large pan and sear lamb on all sides to brown, place in oven and cook 8 to 10 minutes for medium rare or until cooked as desired. Allow to rest for a few minutes before slicing into individual chops. Spoon sauce over lamb and serve with rice and steamed green beans.